Foals returned this year with their strongest LP in quite a while, Everything Not Saved Will Be Lost Pt 1, which serves as the first of two albums they’re planning to release in 2019. They’re currently on a North American tour behind the album, which includes killer support from Preoccupations and Omni, and just hit NYC for a three-night weekend run at Brooklyn Steel. We caught the second show (Saturday, April 13). 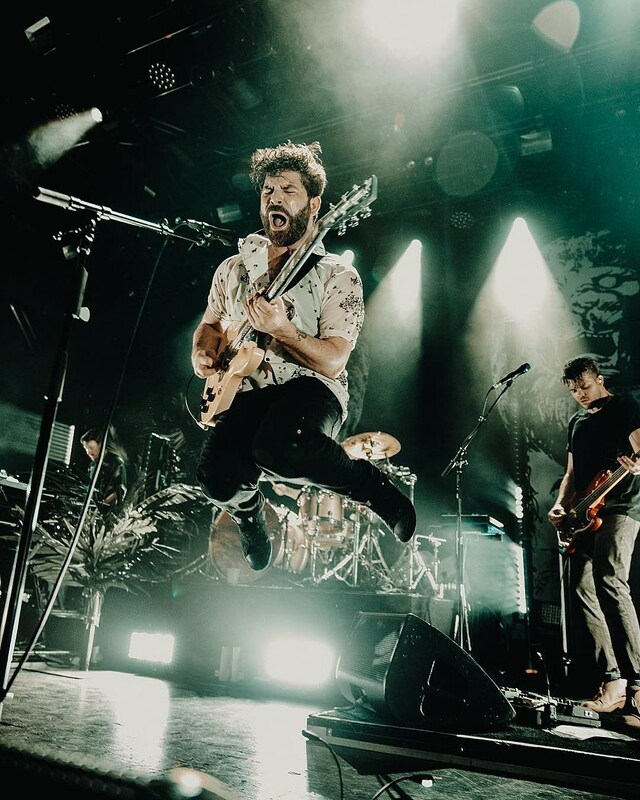 Ever since their 2010 breakout record Total Life Forever, Foals have gained an enormous international following while maintaining the quality of their records since. Everything Not Saved Will Be Lost Pt 1 contains some of the grooviest, most cohesive material of their whole discography, and it shows the band sticking to their guns, crafting danceable alt-rock jams that get stuck in your head for weeks, while not sacrificing their impressive use of dynamics and instrumental tension, and songs from that fit right in among their biggest hits at Brooklyn Steel on Saturday. Upon taking the stage, the band hit the ground running, kicking off their nearly two-hour set with the new LP’s synthy, new wave-inspired “In Degrees,” which served as a worthy opener to their career-spanning set. Foals came back for a two-song encore, starting with the title track from 2015’s What Went Down, which ranks among the heaviest in their whole repertoire. During the song’s crescendo, Yannis slowly crept closer to the crowd and then stage-dove into them while screaming the song’s final chorus. Afterwards, the band closed the show with “Two Steps, Twice,” a song they’ve saved for last at nearly every show they’ve done. The track’s stuttering, math rock rhythm during the first half of the track was complemented by a dazzling light show, before transitioning into the song’s anthemic second half, which had Yannis running off stage and roaming throughout the audience, which had audience members frequently swiveling their heads to try and spot him before he rejoined the band for the song’s visceral finish. Before Foals took the stage, things were already pretty exciting musically; the night began with a great opening set from Atlanta jangle punks Omni, who mentioned they’d recently signed to Sub Pop for their next LP, and played their new single “Delicacy,” along with other tracks from their past two records. Their driving, yet poppy style was a great introduction to Foals’ set, as were Preoccupations, whose set was so strong that, if I didn’t know who was playing, I could have sworn they were the headliners, with vocalist Matt Flegel sounding even more raw and commanding in a live setting. The band mostly stuck to highlights off their 2015 debut LP, including “Continental Shelf” and “Bunker Buster,” while also including the tense “Espionage” from their latest album New Material. They closed their set with the epic, 10 minute-plus “Death,” whose repeated, four-note motif was completely mesmerizing. Foals’ North American tour continues at Washington DC’s 9:30 Club on Tuesday (4/16). View photos and videos of the entire night, along with Foals’ setlist, below. #foals show was so good!